Latest News From FreePBX: FreePBX 12/OTTS Training, AstriCon, FreePBXhosting.co.uk, Mitel and Stable FreePBX 12 News! Open Telephony Training Seminar- Milwaukee, Wisconsin! Tuesday, November 18 – Friday, November 21, 2014 (Optional Packer’s Football Day Nov. 16th!) EARLY BIRD PRICING AVAILABLE UNTIL OCTOBER 31st! Who Should Attend– These sessions are usually attended by participants wanting to utilize FreePBX to get their part of the billion dollar open source telephony market, as well as end users wanting to further their knowledge of FreePBX and the FreePBX EcoSystem. You will attend sessions with FreePBX Integrators, Resellers and those using FreePBX or PBXact within their business or call center environments. Learning & Course Objectives– This instructor lead four day course will be taught utilizing the latest and greatest version of our software FreePBX 12 and will provide advanced training and in depth labs on everything from initial FreePBX configuration to advanced sessions on various components of FreePBX. We will teach advanced topics to market, sell, deploy, troubleshoot, customize and administer Open Source Telephony Solutions based on FreePBX. The labs are designed to progressively provide a base of technical knowledge and telephony know-how. What to Bring – Some basic Linux knowledge, and a laptop. 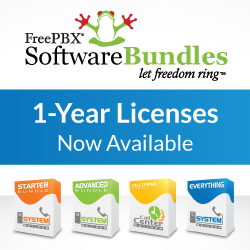 What to Take Away– A fully loaded FreePBX Demo Kit, which includes a Classic 50 Appliance, a Digium D70 and licensing for all FreePBX commercial modules and most importantly Certification on the World’s Most Popular Open Source PBX platform FreePBX! (Optional) Packer Football Special – November 16th, 2014 is a Green Bay Packer home game against the Eagles. Schmooze has access to a handful of Packer tickets at a price of $250-$400.00 per ticket for anyone interested in joining us at the game that Sunday. Green Bay is only a 1.5 hour drive from Milwaukee and historic Lambeau Field is a place all die hard NFL fans need to visit once in their lifetime. Call us at (920) 486-6301 for more information on attending the game. FreePBX 12 is a significant leap forward, providing huge internal upgrades, improved functionality and new features for years to come. We expect to announce the release of the stable version within the next week or two. In the above video, Andrew Nagy (Software Developer for Schmooze Com Inc./ FreePBX) explains What’s New in FreePBX 12 during his presentation at FreePBX World in Las Vegas. Secure module signing to protect the integrity of your system. Updated Module Administration, allowing system administrators to choose between stable and beta versions of modules, and even roll back module updates if needed. Install or upgrade your existing system to FreePBX 12 by visting freepbx.org! Give your business the competitive edge without the expense of investing in a PBX server. Hosted FreePBX service can accommodate all business sizes, large and small. At Schmooze our core focus is telephony and software development, we have partnered with the best data centers in the industry to provide you with world class FreePBX hosting services. Now with services available in the UK. Try FreePBX Hosting Risk Free for 30 Days by visiting one of our partners. View our recent interview with Adam Hobach, President of CyberLynk Network discussing FreePBXhosting.com. Oct. 22-24, 2014 make plans to join us at the Red Rock Resort in Las Vegas, Nevada for three days of conferences, exhibits and new product announcements and demonstrations! To see some things to look forward to at AstriCon please see our recent FreePBX World interview with Billy Chia from Digium. The FreePBX/Schmooze Com team will be available on the exhibit floor (Booth 27), networking events and by appointment please contact us to schedule a time to meet. Mitel has announced the discontinuance of all variants of the Aastra 675xi SIP phones. Schmooze still has some stock on hand of the 6753i and the 6755i for those interested in acquiring these before they are gone. The newly released 68xxi series of SIP phones are great alternatives to the 675xi models, providing significant improvements including enriched functionality, superior audio quality, and enhanced color LCD display. For clients who wish to stay within the 67xxi family for similar form factor the 673xi series offers suitable substitutions as well. These models and more are available in the Schmooze Portal for purchase at competitive prices. Do your part: Purchasing hardware from Schmooze helps provide funding for the continued development of FreePBX! Stay tuned to our blogs and forums for upcoming announcements about a new certified WIFI phone, FreePBX Integrated Cloud-Based Provisioning for desktop, tablets and smartphones and more exciting additions to the ever expanding FreePBX EcoSystem! Copyright © 2014, Schmooze Com, Inc. FreePBX is a Registered Trademark of Schmooze Com, Inc. Copyright © 2018 Sangoma Technologies. FreePBX is a Registered Trademark of Sangoma Technologies. All rights reserved.